Today may have been Monday, but it was a bit of a baking day for me 🙂 Yesterday while menu planning for the week I got a bit of a cooking bug. So, I started a few new (and one old) recipes. I always seem to come up with new recipes when I menu plan. It helps that hubs is home so I’m feeding 2 grown ups + 2 tiny humans (not 2 picky tiny ones & I eat a salad or some ‘kid’ leftovers). It’s just more fun to cook for all of us cause you know those boys adore their daddy & eat whatever he is eating. I mean seriously I’ve seen Cash beg dad for a bite of a protein bar?! But refuse when I offer him grilled chicken? Really kid? After the dough rising overnight, this morning Cash helped me bake a loaf of no-knead crusty bread. 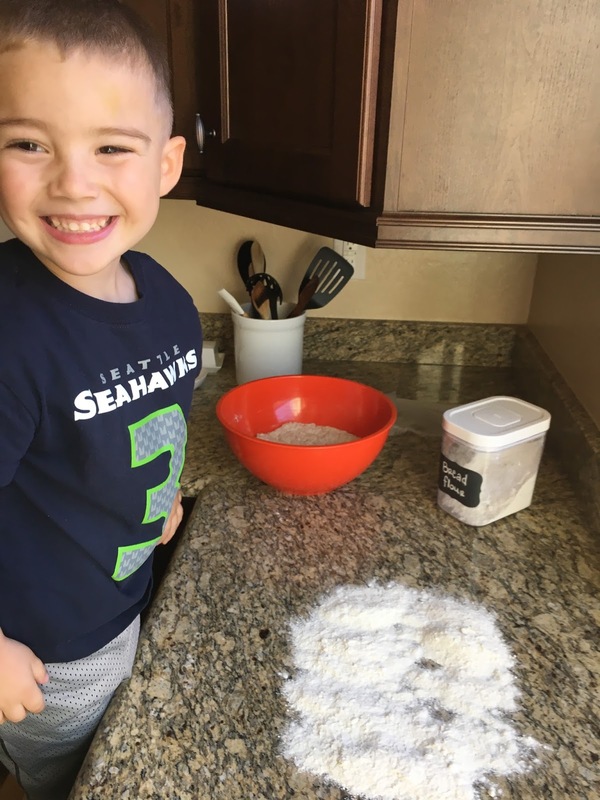 He really is the sweetest little baking assistant!! Anyway… tonight I’m excited to share a recipe for a sweet treat that is almost impossible to resist. They filled my house with the most delicious cinnamon-y-pumpkin-y smell that is still lingering in the air. Hello Fall even though it’s still 95+ degrees here. In my cooking mood yesterday, I actually made up the batter before starting dinner, baked half of it during dinner prep then finished baking the rest off today. These would be an excellent cookie to prep and freeze as little dough balls to bake another time. I really love having cookie dough ready in the freezer to bake whenever you’re feeling the need for a little something sweet. That way you can portion out a 1/2 or whole dozen or whatever you’re feeling like. Just don’t forget to label the bag you put them in with the cooking temp & time. Much easier than searching months down the road for that recipe you shoved in the back of your recipes folder or the one that pinterest decided to delete off your board randomly. I shall leave you with the delicious recipe you’ve been waiting for. Enjoy… And don’t forget to come back & comment what you think of them! 1. In a medium mixing bowl whisk together Flour, Cornstarch, Cream of Tartar, Baking Soda, Baking Powder, Salt, Cinnamon, Ginger, Nutmeg and Allspice for 20 seconds, set aside. 2. In the bowl of an electric stand mixer fitted with the paddle attachment, cream together butter, granulated sugar and brown sugar (not until pale and fluffy, just to combined. Occasionally scrape down sides and bottom of bowl throughout entire mixing process if not using a paddle attachment that constantly scrapes bowl while mixing). 3. Mix in egg yolk, then mix in pumpkin and vanilla extract. 4. With mixer set on low speed, slowly add in dry ingredients then mix until combined. 5. 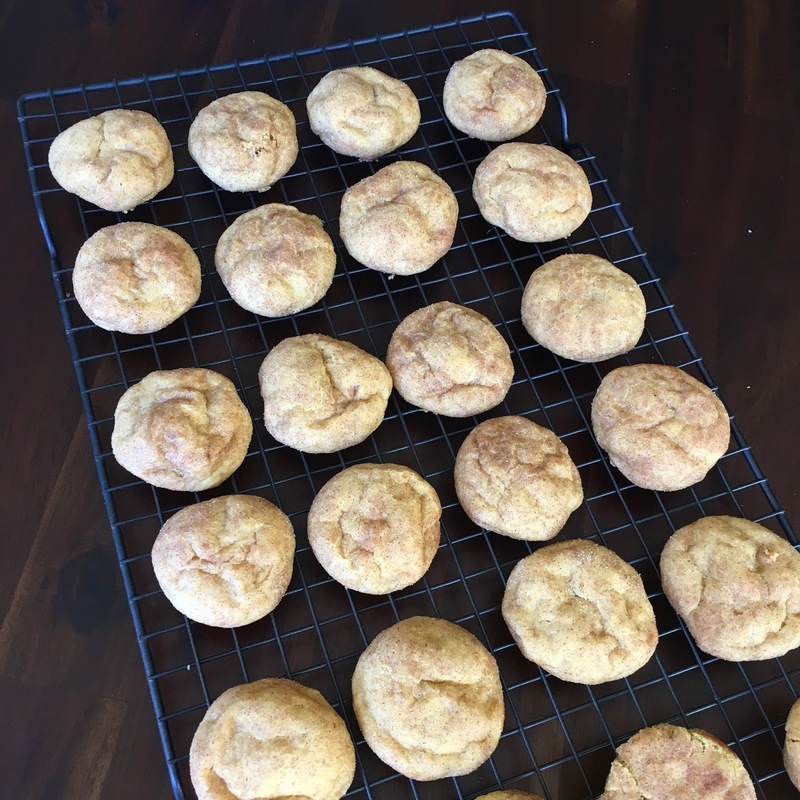 Divide dough in half and place each half in a bowl, cover with plastic wrap and chill 45 minutes to 1 hour (dough should be slightly sticky so the cinnamon sugar will stick when rolling but they should be manageable to roll in the palms of your hands). 6. Preheat oven to 350 degrees during last 10 minutes of refrigeration. 7. In a small bowl, whisk together 1/4 Cup granulated sugar with 1 1/2 tsp cinnamon. 9. Bake in preheated oven 12 – 14 minutes (they should look just slightly under-baked as they’ll cook slightly once removed from oven). 10. Cool on baking sheet about 5 minutes then transfer to a wire rack to cool completely.